Leslee's Creative Inspiration: It's over! Spring break that is! It's over and the boys went back to school today! Yay! The house would have been so nice and quiet and perfect for stamping BUT, Don was home due to the rainy weather. Grrrr! He had other ideas that didn't include me stamping. 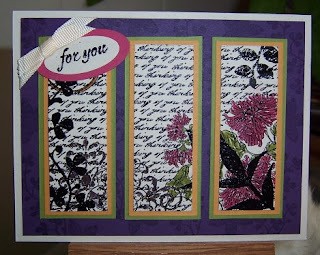 So, since I didn't get much stamping done last week, I will have to share an older creation with you. Thanks for stopping by today. I hope you've been inspired and I promise to have something new to post real soon!